Cruise ships dock in the center of town. Perched on a promontory between Rome and Naples, gorgeous Gaeta has been a popular seaside resort for centuries and has also served as both an ancient and modern naval port. The skyline is dominated by a massive castle of uncertain origins, perhaps dating to the sixth century. A climb up Monte Orlando takes you to the mausoleum of Roman senator Lucius Munatius Plancus, which dates to the first century BC. Here you can gaze down upon Serapo Beach, where you might relax on the fine sands next to crystalline waters upon your descent. 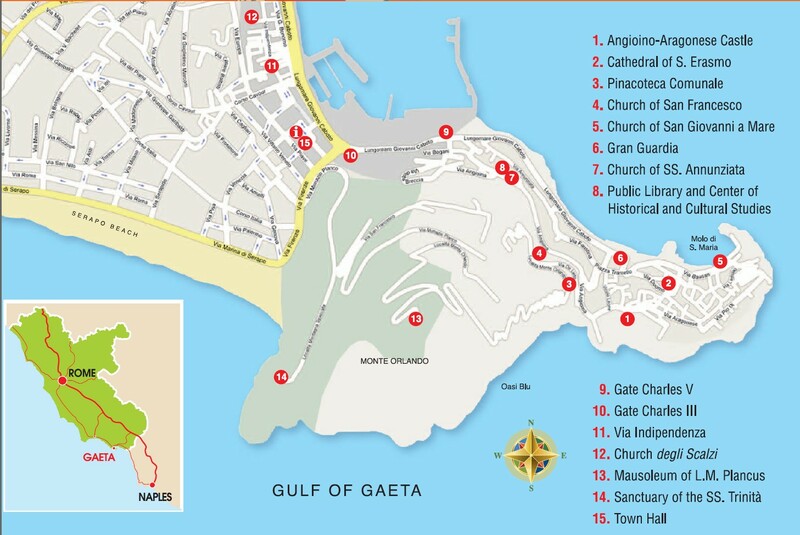 Gaeta is best visited on foot. Rome and Naples are about 60 minutes away by car. If you're looking for seafood, you've come to the right place. Most Gaeta restaurants specialize in dishes featuring local fish and shellfish. You'll also see plenty of the famous Gaeta olives – yes, this is where they come from! Don’t miss the gelato at El Tiburon, at the far end of the old city. Internet cafés can be found both in the city center, as well as at the waterfront. Most shops and businesses in Italy open from Monday to Saturday from around 8am until 1pm, and from about 4pm until 7pm, though many shops close on Saturday afternoons and Monday mornings, and in the south, the day can begin and end an hour later. In the north, some businesses work to a 9am-5pm day to facilitate international dealings. Traditionally, everything except bars and restaurants closes on Sunday, though most towns have a pasticceria open in the mornings, while in large cities and tourist areas, Sunday opening is becoming more common.